The history of the organ starts early in the 16th century, before the Reformation. It is thought to be built around 1520. An organ builder unknown to us mounted a small organ with only a few stops on the north wall of the church. In 1581 Dirck Hoyer was commissioned to add a second manual to the old pipework. Even today, these pipes have been preserved. In 1685, Arp Schnitger was commissioned to build a new organ construction on the west gallery of the Steinkirchen church. Schnitger built an instrument with a great organ, brustwerk, and with upright pedal towers on the sides. The organ was given 28 stops, into which Schnitger integrated six stops from the 16th century. The instrument was completed by him in 1687. In 1947/48 and in 1987 and 1991, Rudolf von Beckerath worked on the organ. This was done with the greatest of respect for Schnitger's organ-building capabilities. Thanks to Rudolf von Beckeraths' dedication and also the fairly gentle handling of the organ in the 19th century, this instrument was able to keep its magnificent sound and was spared any radical changes. Because some of the restoration work of 1987/91 proved not to be long-lasting, some measures needed to be taken to stabilise the condition of the organ from September 2011 to June 2012. This work was completed by Rowan West (Altenahr). The tuning of the organ was checked in all parts and, where necessary, carefully improved and given a non-equal temperament. This temperament was found in the soldered, scaled pipes (Quintadena 16' / Rohrflöte 8') in the great organ and probably goes back to Georg Wilhelm Wilhelmy (1775). 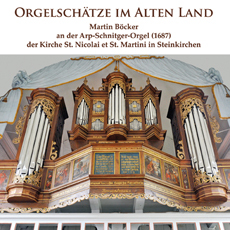 The organist Martin Böcker has chosen the works for this CD with particular attention to the three main organ construction periods and presents examples of music to illustrate this.